The California Department of Fish & Wildlife and Playa Capital LLC have agreed to stop draining freshwaters from Ballona Wetlands via the unpermitted drains. CDFW has applied for a Coastal Development permit to cease the drainage. LOS ANGELES--(BUSINESS WIRE)--Grassroots Coalition (GC), an organization that has long worked to protect the Ballona Wetlands, a predominantly freshwater seasonal wetlands on the Los Angeles coast, prevails in its lawsuit against the California Department of Fish & Wildlife (CDFW) and Playa Capital LLC. Both CDFW and Playa Capital LLC (Playa Vista) have agreed to comply with demands from Grassroots Coalition and the California Coastal Commission (CCC) to cease draining the publicly owned wetlands. 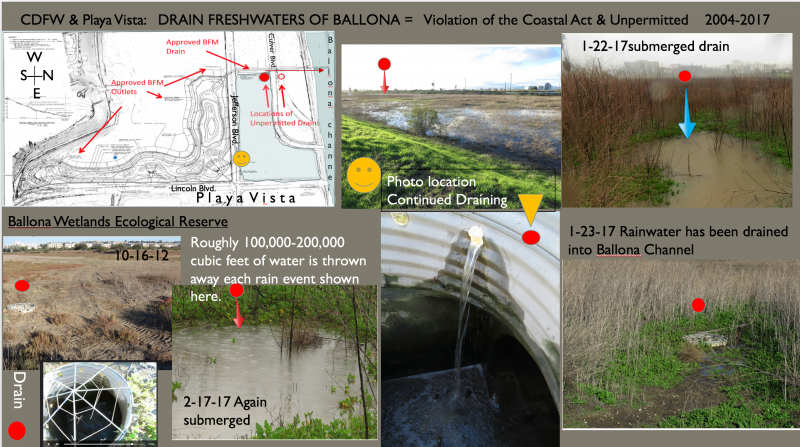 The former landowner of Ballona Wetlands, the developer of the massive Playa Vista Project, first installed the drains in the wetlands in the California Coastal Zone without a Coastal Zone permit as required by the California Coastal Act. 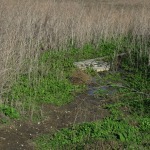 The Ballona Wetlands were acquired by the State in 2004. Since public acquisition of Ballona as an Ecological Wetland Reserve in 2004, CDFW became the steward of the Reserve and has allowed the drainage to continue. CDFW has submitted its Application for a Coastal Development permit to cap the drains. Capping the drains is an incomplete result but there will be a Coastal Commission hearing, expected to be in Los Angeles in August, where the application will be evaluated. After expected, vigorous public testimony, the Commission will decide what remedies, fines and studies must be done to determine environmental harm caused by the drains and any further mitigation that will allow the wetlands to recover. Recent rains demonstrate the rapid dewatering function of the unpermitted drains that CDFW has wrongfully allowed to exist for the past 13 years since taking over stewardship. … “the subject drains are located in the Ballona Ecological Reserve within natural habitat and a wetland that relies on water to function. Thus, the presence of the subject drains is clearly detrimental to natural habitat and the hydraulic functioning of the wetlands. Environmental restoration studies, undertaken since the CDFW takeover of Ballona, have not included hydrology studies pertaining to Ballona’s freshwater aquifers or habitat, and significantly, the studies done have excluded any reference to the ongoing drainage of its freshwaters—both rainwater and groundwaters. The California Coastal Conservancy is in charge of the approvals and purse strings for studies done and has failed to report on the drainage devices and fails in production of onsite freshwater hydrology studies. This is especially worrisome as Ballona has been caught up in years of California’s infamous drought. The State Lands Commission (SLC), since Ballona’s acquisition, now owns, on behalf of the public, the portion of Ballona Wetlands that Playa Vista uses as its flood control element for further development. SLC has allowed Playa Vista, on the east side of Ballona Wetlands, to manage the flood control system to which the unpermitted drains are attached in violation of the Coastal Act. The protection of Ballona’s rainwaters is vital because while its groundwaters are typically at or near the surface due to multiple underlying freshwater aquifers, the Playa Vista development currently dewaters and diverts virtually all of Ballona’s former ground and surface waters—sending them into the Santa Monica Bay or into the sanitary sewers. Approximately 1 foot tall, from soil to grill-peak. Multiple rain events submerged the drains. 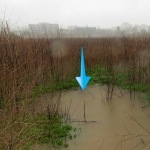 100,000-200,000 cubic feet of water from this drainage area alone. *** Below is a preview of the hundreds of wild life and plant pictures Jonathan has taken over the years. Ballona Aquifers from CDM Playa Vista Draft Environmental Impact Report.